On behalf of Goethel Engelhardt, PLLC posted in Fungal Meningitis on Thursday, May 30, 2013. A pharmacy intern prepares labels while a technician dispenses mixed hormones into syringes.at Clinical Specialties Compounding Pharmacy in Augusta, Ga., in this April 22, 2008 photo. Showing extra caution after the fungal meningitis outbreak that killed 40 people who'd received tainted steroid injections last fall, two compounding pharmacieshave issued drug recalls this week. Med Prep Consulting Inc. and Clinical Specialties Compounding Pharmacy both issued recalls after Med Prep found particles floating in five doses of a compounded solution, and Clinical Specialties got wind of five eye infections in patients who'd received compounded eye injections. 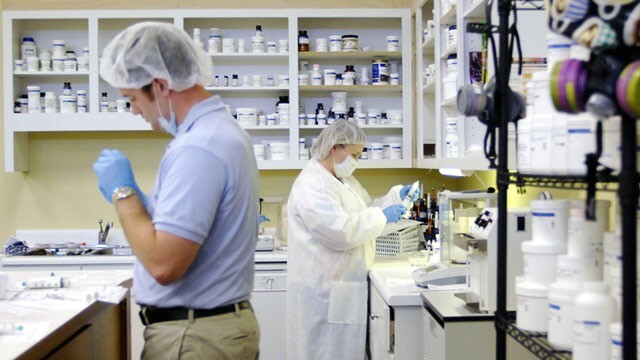 "We don't believe that there is data that points to an increase in these types of issues with compounded medications," the International Academy of Compounding Pharmacists, which represents 2,700 compounding pharmacists worldwide, said in a statement to ABCNews.com. "There is, however, increased vigilance on the part of all health care professionals, including physicians, nurses and pharmacists, and that increased vigilance is a good thing." On Sunday, Med Prep recalled all 83 different kinds of drugs compounded at its facility in New Jersey. A Connecticut hospital notified Med Prep that doctors had found visible particles floating in five bags of magnesium sulfate solution meant for intravenous use. The particles were later identified as mold. "Frankly, it was only the magnesium sulfate that they had contaminated lots of, but in an abundance of caution, they decided to recall everything," Med Prep's lawyer, Angelo Cifaldi, told ABCNews.com Tuesday. "Up until today, there have been no reports of any injury, which is very good." The Trinton Falls, N.J., facility will remain closed until March 22 as part of a voluntary consent order with the state pharmacy board. Until then, the pharmacy will be conducting various tests to find the mold and get recertified by the state. So far, no mold has been found in the facility, Cifaldi said. He said the fungal meningitis outbreak influenced Med Prep's decision to recall all of its drugs instead of only the magnesium sulfate. "I think everyone has a heightened sense of nervousness right now because of what happened in the fall, though this is in no way related," Cifaldi said. If patients were given intravenous magnesium sulfate drips that contained mold, they could have a stroke, become septic or develop an infection in the liver, lungs, kidneys or tissue surrounding the brain, said Dr. William Schaffner, chairman of preventive medicine at Vanderbilt University Medical Center in Nashville, Tenn. He also said that patients who require intravenous magnesium sulfate already had an underlying illness. "Not only do you get the mold, but the mold has been growing in this fluid for a while, and some of its metabolic products are floating free in the liquid," said Schaffner, a former president of the National Foundation for Infectious Diseases. "Any microbe or any microbial form inoculated directly into your blood stream, as this would be, is particularly hazardous." On Monday, Clinical Specialties recalled 79 lots of Avastin, which is approved by the U.S. Food and Drug Administration as a cancer drug but has been used off-label to treat macular degeneration. Clinical Specialties is a small compounding pharmacy in Georgia that takes larger doses of Avastin for cancer patients and repackages them in single dose syringes for eye patients. The drug is injected directly into the inside of the eye. The pharmacy learned that five patients who'd received these injections came down with internal eye infections, but it was not clear what caused those infections at this time, said Austin Gore, the pharmacist who handles Avastin for Clinical Specialties. He said all five patients received their injections from the same doctor. Gore said he has repackaged 150,000 doses of Avastin since 2005 without it causing any problems, and his practices have not changed. Still, the pharmacy has temporarily shut down sterile operations until it can resolve the situation. "Patient safety is of utmost concern," Gore said. He said the pharmacy was working with the FDA to find the source of the infections. Gore insisted he was not compounding the drug because he wasn't "manipulating" it. "It's unit-dosing out an already sterile product into a sterile unit dose," he said. Avastin's manufacturer, Genentech, also makes a similar drug called Lucentis, which has been FDA-approved to treat macular degeneration but costs about $2,000 per injection. Avastin, on the other hand, costs $50 per injection. The catch is that Avastin comes in larger, more concentrated doses for cancer patients, so it has to be redosed and diluted by a compounding pharmacist or a doctor working in a sterile environment. "Somebody has to open that vial and dilute it down," said Dr. Penny Asbell, an ophthalmologist who directs the Cornea Service and Refractive Surgery Center at the Mount Sinai Hospital in New York, adding that's how Avastin's "cheapness" happens. The FDA issued a warning in 2011 after reports that five patients went blind after receiving eye injections of Avastin in Los Angeles, and 12 more Avastin patients developed eye infections in Miami. "Health care professionals should be aware that repackaging sterile drugs without proper aseptic technique can compromise product sterility, potentially putting the patient at risk for microbial infections." Still, Asbell said she believed compounding pharmacists were essential to the medical community because they allowed patients to get tailormade drugs that might never receive FDA-approval because they're needed by so few people. "I wouldn't knock any compounding pharmacist," she said. "Those serious about their business, serious about what they do, maintain sterile techniques and reliable methods for special uses that may never be FDA-approved."